This is cytomegalovirus (CMV) infection in the lung. Note the very large cells that have large violet intranuclear inclusions with a small clear halo. 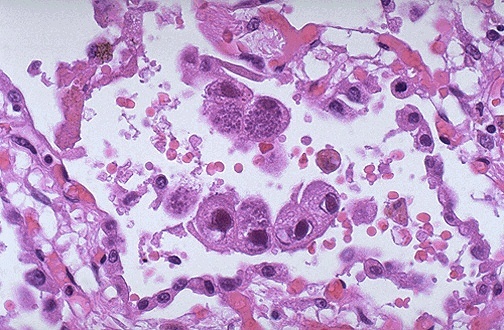 Basophilic stippling can sometimes be seen in the cytoplasm. Over 50% of persons have antibody to CMV, indicating past subclinical infection, but disease producing infection is most likely to occur with immune compromise.